Jared was 10 years old in February 2013 when he became Susan’s companion. 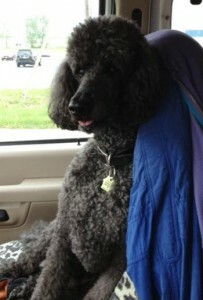 He was her second senior dog adopted from AZ Poodle Rescue. This summer the two of them went through Therapy Dogs Incorporated training. Susan completed the Banner Boswell Hospital Volunteer Orientation and they have started visiting patients in the hospital and rehab facility in Sun City. What a delightful way to spread joy to the senior community! Jared rides shotgun in the van while Susan drives across country to visit family and friends. In June, Jared spent ten days in Dog Hollow with Susan’s grandson, Max, and his three cousins at the other grand parents’ home in south eastern Ohio. It was the best ten days of his life. He got to follow the boys around the fields, play in the creek, bark at the cows on the other side of the fence (Jared made sure they stayed out of the yard), chase the goats and the farm cats, and sleep on the floor next to Max. Jared was off leash the whole ten days and loved it! Last summer we drove across I-10 from Phoenix to Florida. We were delayed outside El Paso at a boarder patrol station. The officer asked if my girl friend and I were American citizens, then asked if there were any others in the van. I said just my Standard Poodle Jared. He said he would record our vehicle as having two Americans and a four-legged Frenchman! Fun! Jared can still catch a tennis ball, despite having one cloudy eye, and is eager to sit and shake hands, if he smells a treat. What a good boy! If I have been away a few days, when I return, he jumps and leaps and twirls with excitement. That is his unconditional LOVE in action.